A couple of weeks ago, on the mud flats in Joy Bay, we tried the beaching legs. These are stilt-like boards that go on either side of the boat to hold it upright, resting on its keel, when the tide goes out. For people who know what they’re doing, with the correct arrangement, this is a commonly used technique, though it is seen much more in the UK than on this side of the Atlantic. It is used successfully with enormous keel boats as well as for smaller craft. When AUKLET was built, in commiseration with the builders we decided to try brackets on either side of the boat, with 1″ x 4″ legs that would slide into slots in the brackets, to then be adjusted for height depending on the slope of the bottom on which the boat might be resting. A couple of years ago I went to test this system, but discovered that the original legs had swollen in such a way that they would no longer fit into the slots. In the intervening time since then, we made a new set of legs, and it was exciting, and interesting, to try them out. The more usual way to attach beaching legs is with a bolt through the hull and the top of each beaching leg, and lines from the bottom of each leg to the bow and stern of the boat. These lines hold the legs steady, and also prevent the boat from twisting, with one leg shifting forward and the other aft, relative to the twisting hull. 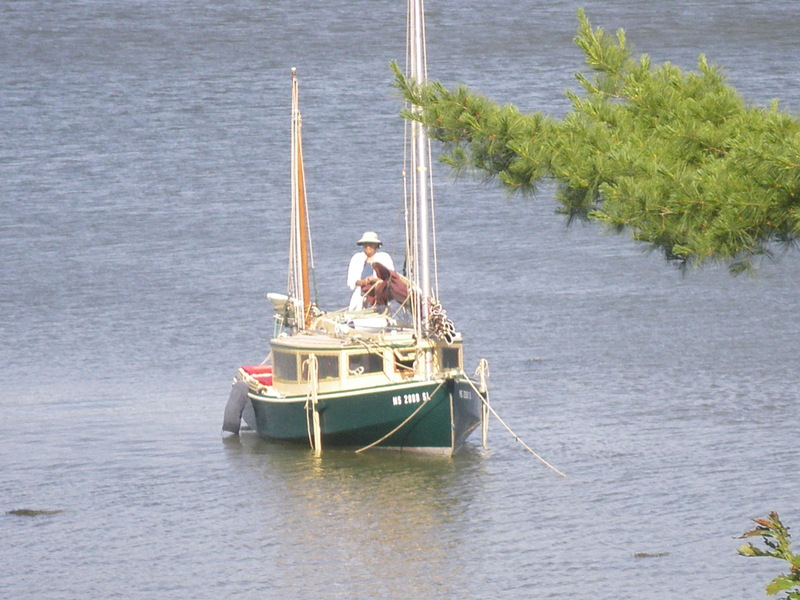 Alternatively, as described in the book Sailing the Big Flush, the legs can be lashed to the shrouds (wires that support the mast, side to side), and adjusted for height from there, also with lines to bow and stern to prevent twist. AUKLET, with a freestanding mast, has no shrouds, and I was not excited about putting bolt holes in the hull, so we tried the rather unique brackets instead. Both location and angle of the brackets was experimental. It seemed like the fore and aft lines would not be necessary, because of the configuration of the slot; I was wrong about that. It also would have been better if the slots angled away from the boat, so that the feet of the legs ended up farther from the side of the boat than the tops of the legs. In mud, it’s necessary to put plywood boards under the feet of the legs, so that the legs will not sink into the mud. This can be arranged with a pin in the bottom end of the leg, and a hole in the middle of each pad, to deal with the issue of the plywood pads wanting to float and slip away when there is still water and one is getting the whole arrangement in place. The pin arrangement would be best – I can attest that an alternative arrangement with a line through the middle of the pad and a hole through the bottom of the leg was less than satisfactory, though it did work more or less, with help from a boathook. It’s quite a production to deploy beaching legs, and it’s helpful to have more than one person, so that the legs can be adjusted simultaneously as the boat settles onto the bottom. Doing this alone, as I was, added extra complications. But then, there were a lot of complications, as a result of trying a new procedure and never having seen it done in person. Also, I made a tactical error that is perfectly obvious in hindsight. Some time back, as part of this post: https://sailingauklet.com/2013/09/22/the-pool-table-effect/ I described a technique, told to me by Tim Pfeiffer (thank you Tim! ), for rocking the boat and letting the keel dig a bit of a hole into the mud so that the boat will settle level, into its mud cradle. Not thinking perfectly clearly, after the beaching legs and mud pads were set for deployment, but not down all the way, I had the idea to do a little of that digging with the keel, by rocking the boat. On the one hand, this did dig a little bit of a cradle, but sadly it completely displaced one of the mud pads, though I was able to rescue it as it started to float by. I was not, however, able to get that mud pad back into position. The situation became a further experiment, as to how far the leg would sink without the pad. The answer is: quite a bit, though it did seem to stop. 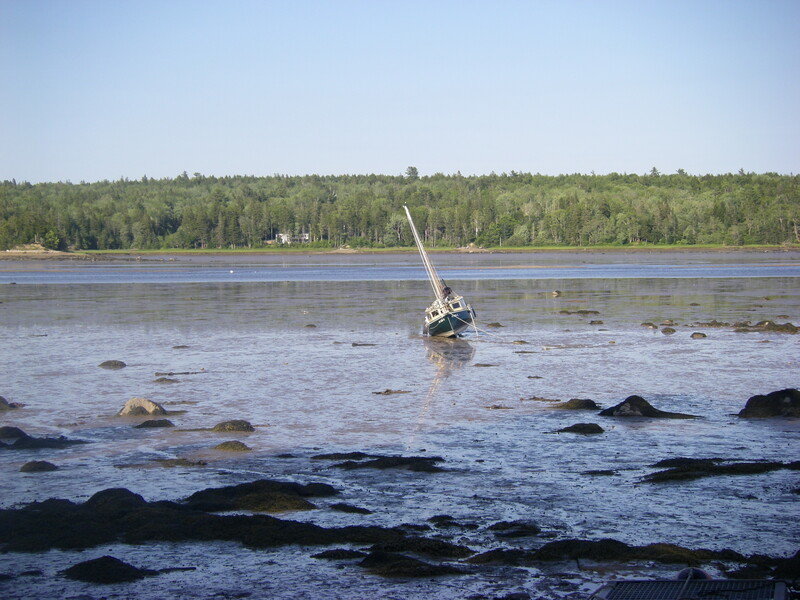 The boat had been positioned previously, using two anchors on fairly long lines opposite each other to avoid the occasional rocks in the mud flat, which came into view as the tide went down. By adjusting the anchor lines it was easy to guide the boat away from the rocks. That part was a success. After that one mud pad came free I gave up on keel-digging, committing to the possibilities of the beaching legs supporting the boat. 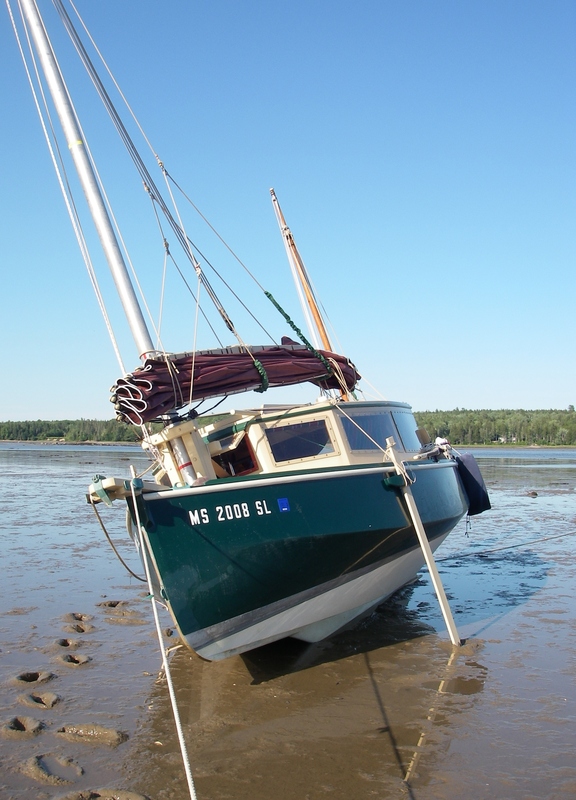 As it turns out, in this new situation the boat was resting it’s weight sideways on the starboard beaching leg. This is not what that board was designed for, and it was not nearly strong enough to support that kind of weight applied crossways. I was inside the cabin getting organized for being over at such an angle for the duration of the low tide, and there was a snap, a bit of a jolt, and the boat went over another 3° or so. This was definitely not in the plan! 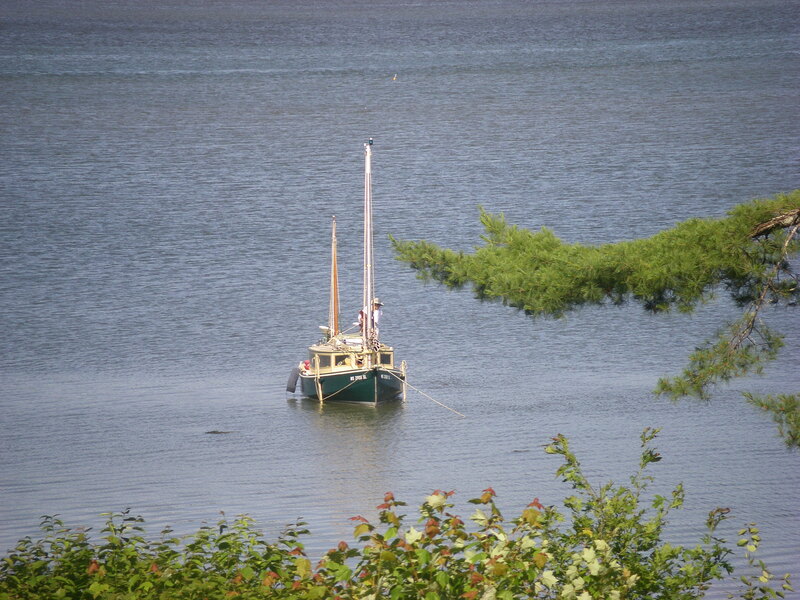 However, the boat was now settled. From the float by the shore Suzanne was able to confirm that nothing in that process had made any holes in the hull, so there was some time to relax. When the tide had gone out the rest of the way I took a little trek in the mud, retrieved the beaching legs (one snapped completely into two pieces), tied the stuck mud pad so that later when everything floated free it would be possible to get it back, and surveyed the situation. 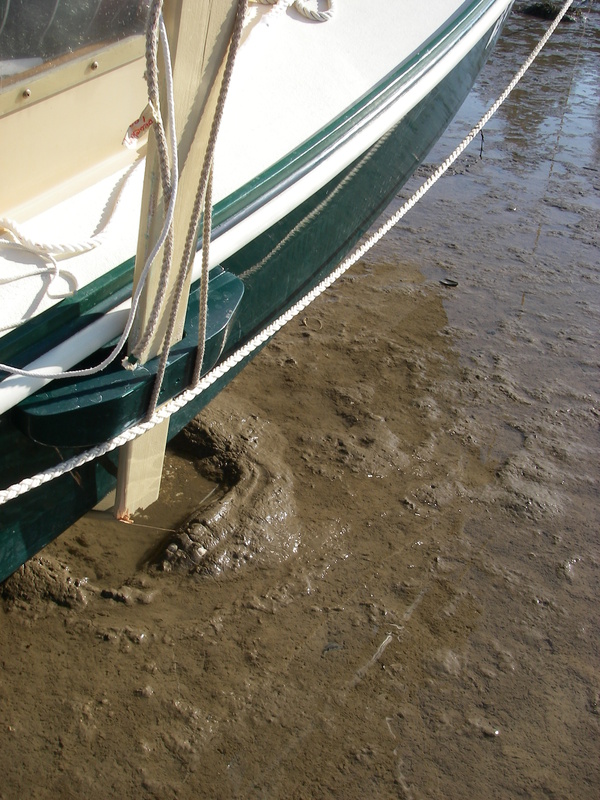 The mud in Joy Bay is very slick – it’s as if the boat was sitting on grease. There was twisting, perhaps contributed to by the gusty wind, even though the sails were all down. Undoubtedly losing that port mud pad contributed, but I do not feel confident that things would have been okay with that mud pad in place. Lines from the lower ends of the beaching legs, led bow and stern, would have stiffened things up considerably, and I do think that with both mud pads in place and those lines it probably would have worked, provided that the lines were actually able to set up the correct tension to keep the legs securely in position. Besides all that, the biggest thing that I learned is that deploying beaching legs is a huge production. The first time of anything is almost always 10 times more effort than after familiarity and routine are established, but it still looks like a big job. Added to that, there is the issue that there really should be two people, in order to set the legs correctly as the tide goes down. What I have absolutely confirmed is that if I were to try this again, I would change the attachment for the legs, adding a pivot bolt hole to the existing brackets, and refreshing my memory on how to make the length of the legs adjustable when a pivot bolt is being used. I’ve read this, somewhere. As it is, I’m quite up in the air about whether or not I will pursue the beaching legs trials. In soft mud, my preference would definitely be to forgo all that effort and potential drama, and simply use the keel-digging trick, hoping to settle at an angle of something better than 15°. I’m looking forward to trying that in Joy Bay, some time in the next couple of months. 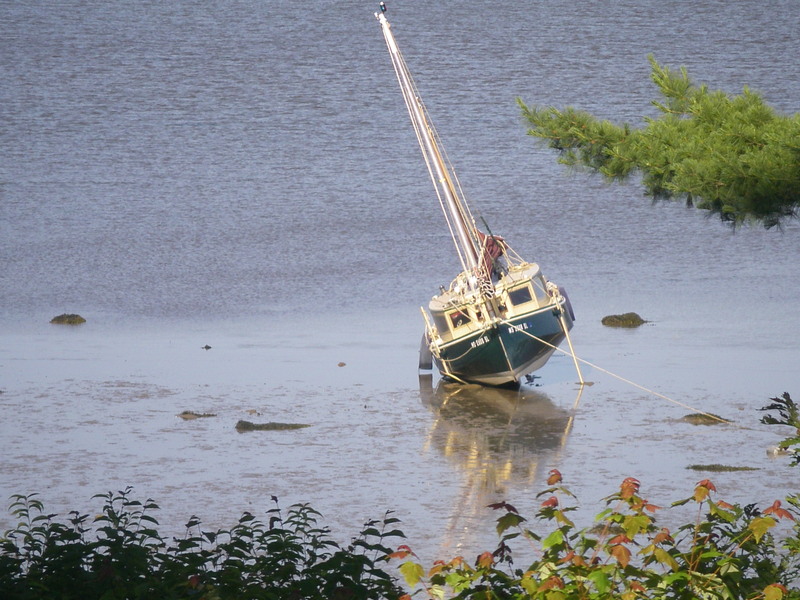 It’s doable enough, to wait out a few hours over at an angle, and who knows, in the right location the boat might dig itself enough of a cradle to go down level even with the tide all the way out to bare ground. That’s an investigation I’m interested in making! In the meantime, much was learned, the boat is fine, and so am I. On the day in question, about four hours after we went down in the mud, just before dark the tide came back, the boat floated, and I got some nice, horizontal rest. At about four in the morning, before things went back to mud, the anchors came up and we relocated back to the mooring in the channel. It’s been a fascinating exercise, and I’m still thinking on the many results. Note: In the process of putting together this post I went back to looking on the Internet on the subject of beaching legs. There is more there now, than when I first came to this subject. I would have done well to read up before this attempt! Sturdier legs would be in order – at least 2 x 4’s, for this boat, in my updated opinion, and for larger boats people are using 4 x 4’s. A number of people have completely foregone adjusting the length. Instead, the legs are built just slightly shorter than the depth of the keel where the legs go, to allow for the keel settling into the bottom, and the whole business is called good, with apparently successful results. At least one individual doing it this way singlehands, and reports the process being easy. It is worthy of note that this ease for singlehanding was achieved by having the pin permanently mounted in the beaching leg for each side, so that it could be easily positioned into the hole on the side of the boat. An interesting detail was that when one of these folks set up this system, he used lines from the bottom of each leg to the bow and stern, and marked those lines for the correct length. When deploying the legs, the lines were first tied at the correct length and then the pin was put into the hole. The leg, and the pin in the hole, were then supported well enough, while the boat was floating, for the singlehanded sailor to go inside the boat and fasten the washer and nut on the inside. An assortment of folks said that they had initial concerns about the holes in each side of the hull, but found them to be easily stoppered, and not a problem. One writer used wine corks, and another used tapered plugs like those for seacock emergencies; both were completely satisfied. A 1X4 positioned flat against the hull is strongest fore-and-aft, weakest athwartship. Therefore lines to bow and stern are beside the point, reinforcing what is already the stronger direction and leaving it very vulnerable. Instead, the slightest side-to-side stress–certain to happen as the boat settles if it leans at all, simply snaps the leg off. Another thing has me a bit concerned: it seems from the photos that the legs are rather forward of the midpoint of the hull. That’s kind of like having a tricycle in which the weight is too far forward, so it tips over easily. I would reposition them to be at the widest beam, which would also give a bit better leverage by being farther from the keel. Angling them outward a bit I agree is also not a bad idea. My own Core Sound 20 takes the ground pretty well without any aid, but the keel is very shallow and the bottom has very little V at the widest beam. It will see-saw, though, if I don’t put something under one side or the other. I’ve been thinking on the position for that pivot bolt also. It would be so convenient to use those brackets, but it’s really true that they are not in the most effective position. The builder liked that spot because it keeps the brackets from doing things like hanging up on docks or making trouble with getting on the trailer, and he had some concern about the boat going down in the bow, when grounded, but based on recent experience, the best leverage possible, from side to side, seems like a higher priority. The lines to the bow and stern are not actually about reinforcing the wood of the legs, but I completely see your point about the strong direction and the weak direction on a thin board. If you don’t have the lines, using a pivot bolt, it’s very possible for the boat to twist on the keel. For example with the boat rotated to starboard, the base of the starboard leg would now be closer to the bow and further from the stern, and vice versa on the port side. Because the legs are then angled forward or aft, they are no longer long enough, and the boat goes over. Those fore and aft lines on each leg are there to prevent that series of events. I had been thinking that the brackets on AUKLET would keep the boards straight enough, but there was too much play, forward and back, for that to be true, even with the depth of the slots. I could suggest a solution using the existing mounting brackets with a metal bracket on a sturdier wood leg. or design some bent fiberglass legs that would bend out for a wider base and give some spring action as they settle into the mud. Not sure about the fiberglass springy legs – I’m quite tempted to go for two by fours at the widest point of the boat, angling out away from the centerline of the boat. Though I see what you mean about springy – if you really knew that they would not break, it would be an interesting way to accommodate the settling process.